On Monday, April 8 at 10:30 a.m. we will kick off the day at the Frank Fischer Senior Center with Farkle. Join us to play this fun, easy-to-learn dice game. 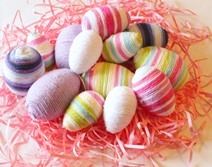 Then, after lunch, beginning at 12:30 p.m. we will be making Wrapped Spring Eggs for Craft day. Stop in and join us, all supplies will be provided. Kilbourn Public Library Bookmobile and Staff are on site from 10:00 a.m. to 3:00 p.m. Library services including check out and check in, hold pickup and reference assistance are available.